Guest post by Stacey McIntosh, editor-in-chief at Sage Advice UK. Many businesses worship at the altar of efficiency in the hope it will improve productivity, streamline data processes and drive growth. It’s not always so straightforward, but it appears these prayers have been answered. Thanks to recent innovations in AI and automation, efficiency has never been easier. AI’s hyper-advanced algorithmic and computer processing abilities can digest mountains of complex data at lightning speed, helping businesses identify trends, solve problems and find solutions quicker than ever before. AI is changing the business landscape – here’s how it’s affecting firms of all sizes in all industries. What are the everyday uses of AI and automation? A chatbot is a pre-programmed automated bot that operates within a set of boundaries for answering questions. 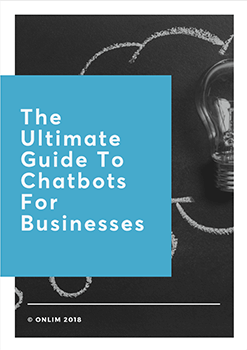 These handy bots are usually employed as live chat representatives that can be used to order food or help schedule flights, as well as asking for recommendations. It’s likely you’ll have read an online article that’s been generated by a machine. AI powered systems are alleviating the pressure on employees by copywriting basic content and descriptions. While the writing style can somewhat lack in personality, it works for some industries and tasks, such as financial reporting. Siri, Alexa, Cortana and Home are probably some of the best-known assistants that fall into this category. Each device is built to use machine learning to understand the behaviour of the owner and offer them relevant options based on their habits. What industries are being affected? One of the most notable benefits of AI and automation is bearing the responsibility of completing time-consuming and repetitive tasks without error. Employees can breathe a sigh of relief knowing this time can be invested into more important and pressing matters. Here are some more examples of how AI and automation are affecting certain industries. AI’s influence in the healthcare industry could be nothing short of remarkable due to its life-saving potential. When scanning radiology images for tumours that cause lung and skin cancer, AI’s application of algorithms enables them to detect cancer signals with greater efficacy than the world’s best radiologists. This decrease in diagnostic processing time allows doctors to make better informed decisions and apply treatments sooner. The benefits of AI in healthcare don’t end there. Virtual health assistant chatbots are being used as a front-line communication tool for appointments for patients, when appropriate. Bots can also be used to prompt people to take medication on time, as well as providing important medical advice and answering patient questions. Banks that integrate sophisticated AI systems will be equipped with a powerful weapon in combating fraud. Machine learning algorithms can put a stop to accounts that signal any suspicious activity through its ability to identify deeply hidden patterns of data. Chatbots are also being used at quite a sophisticated level for management of money and savings. Account holders offering full access to their bank’s AI will receive financial and savings advice at a micro level. The personalisation of learning methods is the game changing feature that AI has to offer the education industry. This intricate system is capable of analysing student’s optimal way of processing information, providing tailored support based on their learning needs. For students who have learning difficulties, this could be life changing. Teachers can also breathe a sigh of relief knowing they no longer have to spend hours marking papers, thanks to automation. Machines can take over menial tasks like marking with ease, even completing them with greater efficiency. For more information on what the future holds for AI and automation, check out our comprehensive guide here. Stacey is the editor-in-chief of Sage Advice UK. He has more than 15 years of editorial, PR and social media experience and has worked across print and online for national newspapers, magazines, PR and marketing agencies including Metro, GQ, Men’s Fitness, International Business Times UK and Cool Blue.